Jonathan Roberts of Fantastic Maps has published a fantastic quick tutorial that teaches you how to design a town. I’ve been a fan of Jonathan’s work for a long time especially since he was commissioned to produce The Lands Of Fire And Ice. 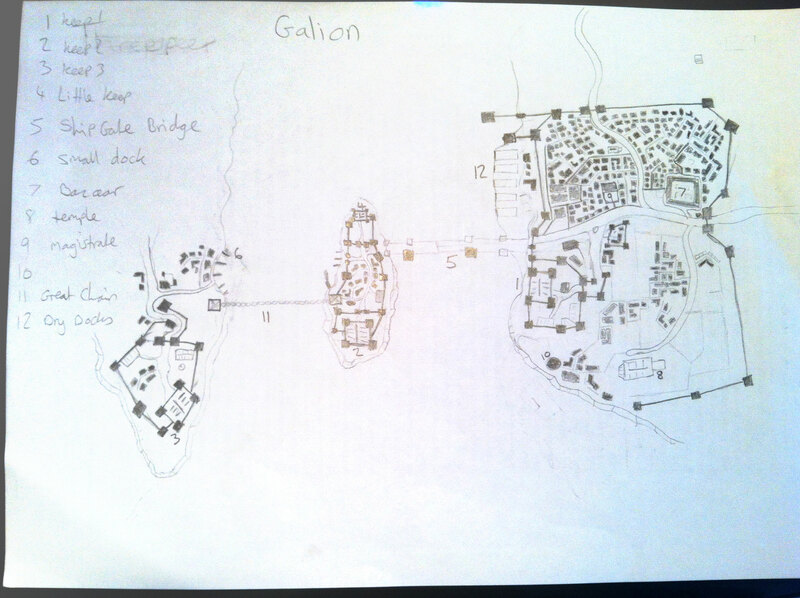 I’ve also been playing with the idea of focusing my whole world building efforts on just one city. So here is the result of a city I’ve sketched out using the tutorial and it may very well be the city I use for my future world building. If you’d like to view Jonathan’s tutorial then please go here. Note: I do apologise for the quality of the photo’s. They were taken on my iPhone in bad lighting but I’ve tried to improve their quality in Photoshop. 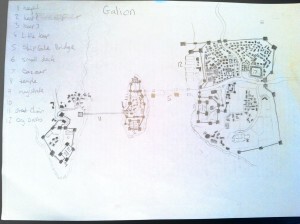 I will be redrawing the map in Photoshop at some point and will update these photo’s with renders of that map. For that reason it not only gains financial aid to maintain such a military presence but it also gets all of the passing trade travelling back and forth from the heart of the empire. The next step Jonathan recommends you do is to add the major roads into your city map. This helps you to build up a natural flow of highways between the cities most important locations. For my map this was quite simple. 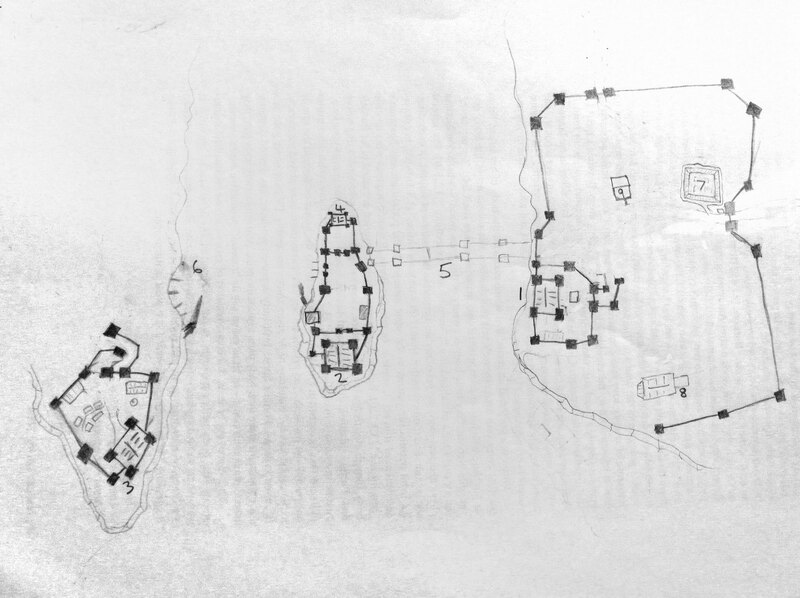 I had decided that most trade by food would come through the east gate (right hand side) so the main road runs from east to west as this also provides a link to the island castles bridge. The majority of people travelling up river to the capital would probably use the river rather than the road. However there is still a main road coming into the city from this direction also. Finally for this part of the city I needed to connect the keep to the main road and the temple/church in the south. 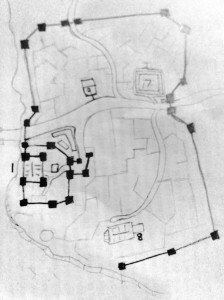 The castle on the western bank was easy to work out as there is just one main road coming into the keep and a smaller road that breaks off to the docks. 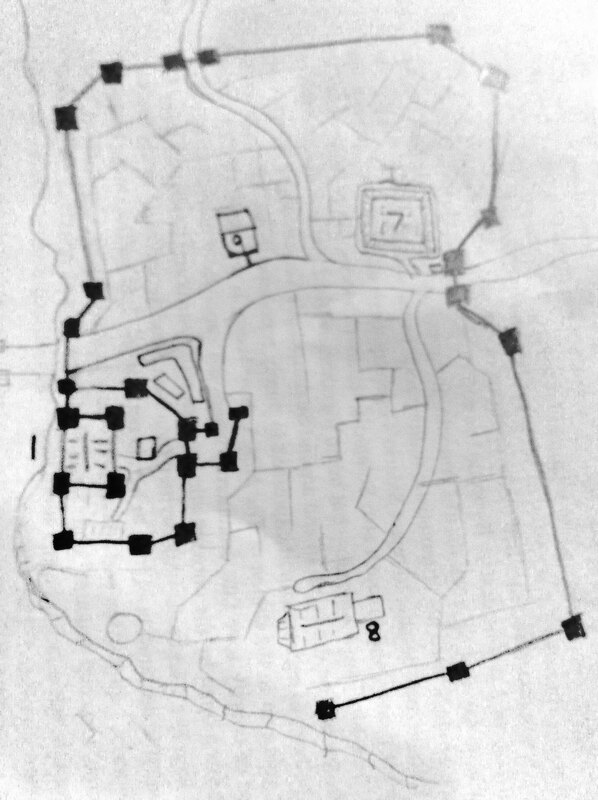 When it came to placing the minor roads I had a bit of fun sketching random paths and routes around the city. At this stage I did try and block out a general idea of what I could be placing in the city. E.g. 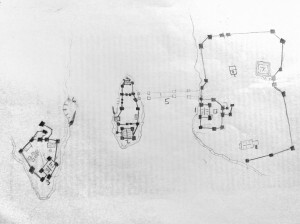 warehouses, poorer area, richer area, merchants, guilds etc. though these thoughts were rough ideas to hold on for the future. Now I haven’t finished this step in the city drawing phase. I’ve filled in all of the castle buildings and added some housing to the dock on the west bank. Also the whole northern sector of the city has been filled with small housing – though I’m still not 100% happy with the way they look. Final stage will be to finish off the houses in the southern side of the city. This is the more affluent part of the city, the closer you get to the cliff face (and the great view). Also, while drawing the minor houses I remembered that I’d wanted this city to not only be a powerful military/merchant city but to also build ships. So as you can see from this map I’ve added in 5 dry docks to the main city (number 12). I had tried them on the east bank but they felt a little exposed so they were moved behind the bridge for extra protection. Also the main work force will be within this side of the city so it makes sense to have the docks there. What’s next for this city? So there you have the basic outline of this city. I will be using this city map to explore the depth of world building that can be built within one city. You can expect to see new maps drawn that show off a certain part of the city in more detail. Information on trades, guilds and how to integrate them into any stories you may be writing at the time. The next part in its development will involve calculating how many people live within the city walls. Once I have this number we’ll be able to work out how many bakers, doctors, shoe makers and even nobles live within the walls. Don’t forget, if you’d like to draw a city of your own then please visit Fantastic Maps and go through Jonathan’s tutorial for yourself. Also you can keep updated with the progress of this city by subscribing to The World Building School here.